Taking a minute to smell the flowers isn’t that hard nowadays, but angiosperms (a.k.a. flowering plants) weren’t always as ubiquitous as they are now. They appeared rather suddenly in the fossil record, definitively showing up around 132 million years ago. 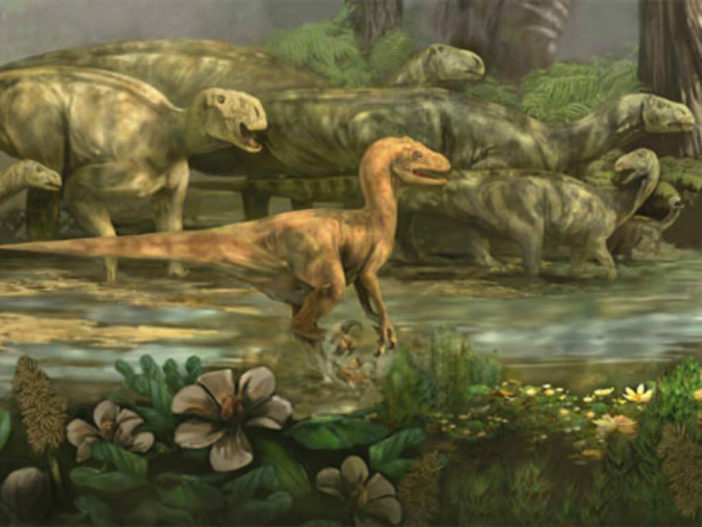 Their sudden appearance has puzzled scientists from Darwin on to the present day, and while today we understand a bit more about how they diversified, scientists are still learning new things about their history. In a new study published in Geology, scientists think that they’ve figured out another piece of the angiosperm puzzle. Researchers looked at the patterns of leaf veins of flowering plants in tropical forests in Panama and a temperate forest in Maryland. They looked at the leaves of 132 species, reaching the top of the forest canopy with a 131-foot tall crane, and also taking a look at the leaves that had fallen to the forest floor. Leaves that originated at the very top of the trees tended to have a denser collection of veins than the ones further down the tree trunk. The scientists then compared the patterns found on the leaves in the forests to leaves found in the fossil record, and discovered that flowering plants had reached the heights of the forest canopy around 58 million years ago, during the Paleocene, just a few million years after the dinosaurs went extinct. Previous ArticleDo All Plants Bloom?